Save $195 by purchasing them together! WHAT's NEW in ISPME Version 13? 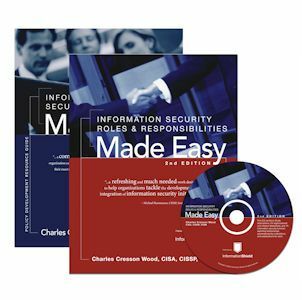 Information Security Policies Made Easy and Information Security Roles and Responsibilities Made Easy are available for electronic download. Each product contains a print-ready PDF, editable MS-Word templates and an organization-wide license to republish the materials. (No physical CD or book). The complete library contains over 1500 information security policy statements with expert commentary on the following information security topics within the Common Policy Library (CPL). In addition to sample policy documents, the following forms and agreements help you implement your information security program. Policy: The Chief Information Officer (CIO) must clearly specify in writing the assignment of Information Ownership responsibilities for those databases, master files, and other shared collections of information used to support production business activities. Commentary: This policy establishes a clear and documented delegation of information access control-related authority. A definition of delegated authorities is useful when determining access control permissions. This policy clarifies who is responsible for security and related matters for shared information resources such as a database or network file share (the Owner is). Often information security activities are forgotten when several people are potentially responsible but no one has been specifically assigned responsibility. This policy will be particularly helpful within organizations that rely on database management systems and application programs to enforce access controls.